The Pirates' Brian Giles came barreling around third determined to score. Determined to keep him from scoring was Expos catcher Darron Cox. Giles scored, essentially by trying to run Cox over at the plate, The Pittsburgh Post-Gazette wrote. Cox was likely more than happy to be in that situation. He was playing in his 11th major league game - after a decade playing in the minors. Cox' big league career, which took so long to start, would also quickly end. He got into just four more major league games. 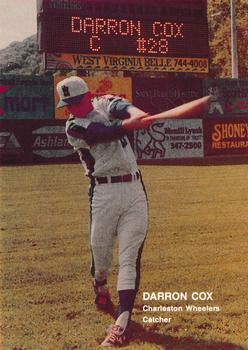 Cox' professional career began in 1989, taken by the Reds in the fifth round of the draft out of the University of Oklahoma. The Reds took Cox the year he was named Big Eight Player of the Year. He hit .362 that year, with eight home runs and 19 stolen bases. In April, Cox hit a two-run, tie-breaking double to help the Sooners to a win. As a pro, Cox started with rookie Billings, hitting .274 in 49 games. He moved to single-A Charleston in 1990. He first made AA Chattanooga for 13 games in 1991, then played there each of the next two seasons. For 1994, Cox went to the Cubs with two other players in a trade that sent Chuck McElroy the other way. The next spring, Cox showed he could bunt, squeezing in the winning run in an early March game. In another game, he committed a throwing error, but came back with a home run. For the season, though, it was back to the minors, making AAA for the first time at Iowa. Over the next four seasons, Cox stayed largely at AAA, spending time in the Cubs, Braves and Devil Rays systems. He even spent time in Mexico, with Mexico City in 1997. For 1999, Cox signed with the Expos. And, after a decade in the minors, On April 6, he debuted in the majors. He got his first hit in his third game. He hit his only home run in his eighth. Cox played in his final major league game June 26. Overall, Cox got 6 hits in 25 at bats. Cox played just two more seasons, signing with the Rockies. He played those two seasons back at AAA, at Colorado Springs. Since the end of his playing days, Cox has spent time as both a coach and manager in the minors. He spent three seasons as a hitting coach at AA Tulsa, from 2003-2005. For 2006, Cox then moved up the manager's office, at rookie Tri-Cities.